Apple is planning to overhaul its year-old music streaming service to make it "more easy to use", according to people familiar with the matter (via Bloomberg News). The company is set to redesign the user interface to make it more intuitive, said the sources, who asked to remain anonymous because the plans are yet to be made public. Apple also means to significantly enhance the integration of its streaming and download businesses and expand its online radio service. According to Bloomberg, a full reboot of Apple Music is to be unveiled at the Worldwide Developers Conference in June and will be accompanied by a fresh marketing campaign to entice customers to the subscription-based service, which currently costs $10 per month. 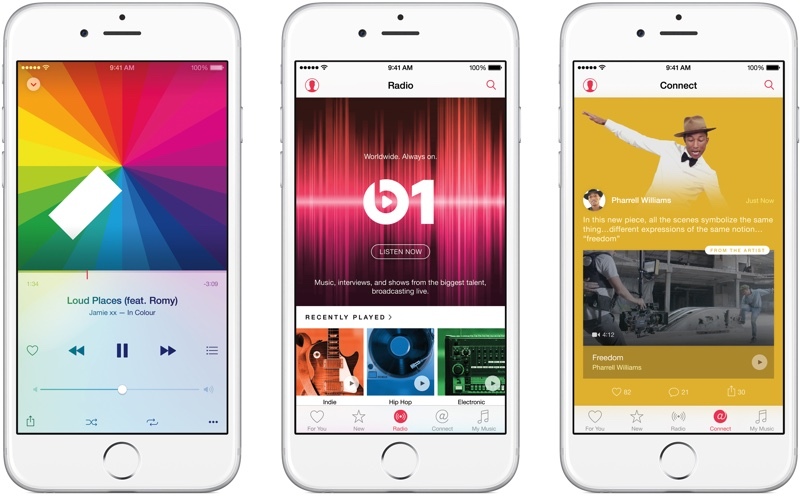 Apple Music was introduced with much fanfare back in June 2015. While many commentators gave generally positive reviews, the service was criticized for its muddled interface and dearth of features. Meanwhile, Taylor Swift penned an open letter to the Cupertino company criticizing it for not paying artists during the service's free three-month trial and explaining her decision not to make her album 1989 available to stream on Apple Music. Artists have also complained that Apple Music's social aspect, called Connect, "fails miserably" in its aims. Apple has struggled to integrate its employees and unite the streaming and downloading businesses into a cohesive music strategy, according to the latest report. As a result, the service is now being overseen by content head Robert Kondrk and Nine Inch Nails frontman Trent Reznor. Design chief Jony Ive's team has also been involved, along with former Beats co-founder Jimmy Iovine and senior VP of Internet services Eddy Cue. Apple Music has reached 13 million subscribers, announced Apple CEO Tim Cook at last week's earnings call. The figure was 2 million higher than that reported in February, indicating a growth rate on par with industry-leading streaming service Spotify. Update: Details about the upcoming Apple Music redesign have been shared by 9to5Mac. It is said to feature a "bolder, yet simpler" design that puts an emphasis on black and white backgrounds and text and more of a focus on album art. The "New" tab in Apple Music is being replaced with a "Browse" option with better organizational tools for finding new content, and Apple will encourage users to use a simplified "For You" section. Connect, Apple Music's artist-focused social network, will remain unchanged, as will Beats 1 Radio. New 3D Touch shortcut previews will be added, Apple will make sharing features more obvious, and a feature allowing listeners to easily access song lyrics will be added. The new Apple Music app will reportedly debut at WWDC in iOS 10 and will be introduced through an iTunes update on the Mac. Apple is planning to overhaul its year-old music streaming service to make it "more easier to use", according to people familiar with the matter (via Bloomberg News ('http://www.bloomberg.com/news/articles/2016-05-04/apple-to-revamp-streaming-music-service-after-mixed-reviews-departures')). Not just easier. More easier. I absolutely hate what Apple Music has done to the music app. Apple basically destroyed the iPod part of the iPhone. I actually had to download a third party app to be able to control my music to any functional degree. Apple please reinstate in the old music application and make a separate Apple Music app. It's a convoluted mess like iTunes. Make it simple! Apple Music never felt like "home" to me. I love the old music app. The very first version. When I use my iPod touch (2010) for sports, I'm so happy with this basic music app that works like it should. It does the job and I can find every song, artist or album within seconds. Maybe make it user friendly and easy to underseand. new interface, same old broken icloud music library. What about that iTunes refresh coming "next month"? Edit: We shall see how this turns out. Sad, that they couldn't get it right the first time, its not like this is the first time they did music. I'm looking forward though a new design that will make it a bit easier to use. What terrible grammar. This should be either "easier to use" or "more easy to use". Anything that makes it more gooder is fine by me.